Alot of the people close to me can't wait to start 2007! So much so, in fact, that Bill went to bed early, just so that the New Year would start sooner! Pulease... put 2006 away! It was an historically tough year! Here I sit, eating Chex mix at 8 in the morning. I cannot wait to get rid of the Chex mix, and so it is my thinking that if I just eat the whole bag, it'll be gone and I'll be done with it! I mean, after all, if it sits around and I keep munching on it for days, then I'll get fat. If I just inhale it, now, it will be gone and I won't get fat. See how that works? Get rid of the stuff! Quick! Stan Fagerstrom sent me his new column. For all of those that want to learn about Senkos, click here. Stan knows about everything. I can't understand how he retains all the knowledge that he does. He's an amazingly talented angler, full of things we can all learn. Thank goodness that he's willing to share what he knows with us! I'm proof reading a manuscript by Francis Caldwell, this week, now that I have a little eyesight!Another exciting Alaskan tale! It's so good! I can't wait for it to go to press! If you haven't read any of his books, please do! They are wonderful, exciting tales of living in Alaska, fishing, boating, big seas! Hey! Here's a neato link. Remember that bracelet, earrings and necklace I was so excited about? Well, now you can order one! She has opened a web site! She is one of our own ifishers. Click here to browse her beautiful art work! I'm going to go out and fish, today. I just didn't feel up to it, yesterday. I'm not going to catch anything. In fact, if I have to go alone, I'll just go without a hook. Seriously. I just need to cast, and I really don't think I'd have the good sense, or the strength to cut one loose, should it fall for my tricks. The thought of a spinning, chrome winter steelhead on the end of my line would just be too much for me to turn away from. The doc said, "No fishing for two weeks." Not only have I followed his eye drop instructions to a tee, but I will follow this, too. I want my vision back, badly! The pain is starting to diminish, although it's still very achy. In the past, I've had a great bruise around where they worked. This time, not! I think Dr. Hwang is a miracle worker! I'm already thinking about having him work on my other eye! Pretty soon, you'll all be calling me eagle eyes! I've been admiring my crystal agates. The other day, I was walking up my back trail from the river, and found 7 beautiful agates, all lined up on a log, near the trail. I wondered who would have put them there, like that, for me to see. It turns out it was Bill. He is so sweet! He said, "I knew you'd find them!" This picture does not do justice! 2007 will be free of aortic dissections, lung cancer, loss of pets, loss of close friends, loss of relatives. I just know it will be. Maybe not totally free of, but certainly, it has to be better! The Good Lord above knows what he is doing, and I can assure you that we are stronger people because of what we've been through. I know that these things must be necessary in the whole scheme of things, and I pray that I have learned whatever it is that we were supposed to learn from these events. I pray that our Heavenly Father sees fit to help Bill and I get out on the river, more this year. One thing we have learned is that you need to be in the loop, in order to be successful anglers. You can't just go now and then, and have good days. You have to be on top of things. We weren't able to do that this year. Next year, my prayer is that we will be back to normal, and that our boats will use more fuel and have more visits to the gas stations then will our cars! Oh no! I have to go get my fishing license this morning! I am NOT off to a good start! Jim, you are the first person that has passed away, that I would have liked to say goodbye to, after you had passed. I just wanted to hold your hand, buddy, and say good bye. I've never wanted to see anyone after they had passed, before. Just know, that I am holding your hand now, and always. I'm going to start off with a happy thought that I spoke to Bill yesterday morning. It just struck me, quick as can be! f you didn't know, Jim lost his beloved Tripod months ago. It was a nasty little dog, who growled and bit at people, but we loved Tripod! Anyhow, he was very sad at losing his beloved pet. .If you don't know this writing, you should read it if you have lost and beloved pets: Rainbow Bridge has always made me feel better. I said to Bill, "You know what? Jim Erickson is at Rainbow's Bridge! With Tripod!!! But, Tripod isn't three legged, anymore! Tripod is healed and is now Quadpod!" I don't have writer's block. I'm so full up that I don't know where to start. I guess it is writer's block in a form, but it's so different! I'm totally stunned. Since my surgery, I have not had one full day of rest. I have been supposed to rest daily, do nothing, lay my head on a pillow, not even watch that much TV. You know... after surgery "rest". Ever heard of it? A good test of rest for our family, is how many nice sit down family dinners we have had, together. Not only are these currently interrupted by the fact that my children have decided that we are immoral for eating meat, but we have been so busy with things, that we just don't have energy to fix, nor set the table for such activities. I did, one time, and it was a disaster. The kids turned a prime rib, cooked to perfection, into an immoral event that their parents had forced them to witnessed. We are awful, cruel people, don't you know? To kill an animal, and serve it on a platter? To actually cut into it, and eat it? Oh my gosh. "We should be eating babies." They told us. "Just the same, isn't it?" Teenagers are difficult. Young adults are impossible! Sorry. But, I hunt them, kill them, and eat them. I can't help it. They taste good! Besides, I hold a bet that they'll get over this stage. I was once there. If they don't, so be it. I was a macrobiotic hippy once, too. Fact is, I don't rely on meat so much. I could easily quit eating it at all. I much prefer starches and veggies, and am often known to push the meat aside. But, I haven't anything against it, so when I feel like a cheeseburger, I eat one! I just try not to think about it. Fact is, if I thought about it, I, too, would join them. They have a point,don't they? I'm not going to talk about this any more, cuz if I do, I may join them right now. Yikes! I'm chatting about this because, well... there is so, so, so much more on my mind, and it's easy to talk about this. *Rev the dog who poops on the floor and chews 200 dollar shoes up. *To sell ifish, or not? *Beginning to write my 10th year in a row, of ifish. *I still haven't fished in 2007 and that was my resolution. Failure! Failure! Sometimes when I get so full up like this, I have to remember what I learned as a child. To "let go, and let God"... and that is what I'm going to do, today. Tomorrow is Jim's funeral. Besides practicing a song that I have not played for 20 years and have to play in accompaniment to a vocalist, tomorrow, I have today off to relax. It was such a shock to look at ten years of my journal, here. It seriously seems like yesterday that ifish was created. When, though, did it take on life? I think, about in the third year. Maybe the fourth. I don't know! But, right now, it's growing by leaps and bounds! I just laugh, now, that I thought for so long that it would level off. When I was not seeing at all, I took on a kind of dependence on others, and frankly, it's frightening, now, to see. No longer do I need to ask others to drive me places, or read things for me. It's a scary new world and I've yet to drive anywhere, myself. I keep thinking I will, but I've been frightened to. I drove once, and only to the Post Office. Today, it's more! Here I said I had nothing to do, but I'll tell you, that is a bunch for me! It's hard to break back into independence! And yet, in other ways, I am very strong and independent. It's an odd balance. I can't wait to play piano, on Saturday. I haven't had anything to play for that I cared so much about, in so long. It is like speaking in tongues, playing for something like this. Music flows, and it has a mind of it's own. Who knows what I'll play? What will come out? It'll be a surprise to both of us. When I play like that, it's not me. It's our Heavenly Father. People will sometimes say to me, "Oh, Jennie! Your playing is beautiful!" and I say, "I know!" I'm just as surprised and as touched as others are. -And I honestly can't take credit for it. In fact, sometimes I'll look down at my fingers and think, "Wow! What's happening?" At that point, I often make a mistake, too. It's amazing to me! Always has been. Always will be. My eye sight... sigh.... It's wonderful! I can see to read! I can see MY BOBBER! I can see! However, it's not quite like real sight. More on that later. I'm just going to celebrate what I have! It's good enough for me! And then there is Jim. I visited Loretta, yesterday, and then went to rehearse with the lady who is singing. Long pause. That's all I have to say 'bout that. Anyhow... I wish you a very Happy New Year. Things have got to look up. Now, I just learned of a friend's heart condition, and I must go. I sure hope this isn't as bad as it sounds. Grant McOmie's segment on Jim Erickson was delightful, sad, touching, brilliant, and... entirely heart breaking for Bill and I. It was the first time we cried. I mean, really broke down and sobbed. If you want to see it, please click here. The fog was suffocating. I could imagine sitting in a boat with Jim out on the bay. "Is anyone looking?" Jim whispered. He'd hold his bait down under the gunwale while he applied some not-so-secret scent. Still, I'd laugh. After the Memorial Service, Bill drove me out to the restrooms at the boat ramp at The Nehalem State Park. We needed a breath of fresh air and a drive. This, too, is where we fished with Jim Erickson. We fished with Jim almost everywhere! As I got out of the truck, the dense fog made it seem like anything... or anybody could be at the boat ramp. I really felt Jim's presence, there. I yelled towards the jetty into the damp fog, "Hellllllllooooooooo Jim!" It echoed back at me. I glanced back at the car as I headed for the outhouse. Bill was bent over the steering wheel, sobbing. I hadn't meant to do that. As I climbed in the warm truck and closed the door behind me, I felt like I was closing the door to fun. "Life just won't be as much fun as it used to be." I started. Bill agreed. Jim was alot of our life, together. A big part of our fun. He introduced me to Bill, in fact. He also served as my private venting line, when things were tough, between Bill and I. I'd call him late and night and complain about my romance woes. I can still hear Jim's voice on the other line. "Give me one week with you, woman! I'll have you trained!" Jim wasn't quite so used to a woman so independent as I am. He was shocked that I'd have Bill do the dishes from time to time. Horrors! I asked Bill on the way home, yesterday, "Did Jim say anything to you, before he introduced us? Was he playing match maker?" If he had been, I had no idea of it. Jim had said nothing to me, when Bill showed up to fish, one day with Jim and I. Bill thought about it. I think he was thinking about how to get out of this one! He knew darn well that Jim had probably said something like, "Single, likes to fish! Get her!" But Bill is too much of a gentleman to admit that, so Bill just said with a question in his voice, "Hm... Yeah. I think he did say something about that I should meet you." I honestly don't have to wonder what it was he said. I'd still like to know, though! "Come on, Bill! What did he say?!" And then came the oft repeated words I hear, when guys are at a loss for words. "I don't remember." Argh! That age old excuse for "I'm not tellin'!" I just went to the archives of my journal, and started in the first month of January, 1999. Trying to figure out when I had met this whirling dervish of a man, I did a search on the page for "Jim". I had already met him and was fishing with him in '99. I have no idea when I met Jim. '97? '98? I'll have to search my old e mail, I guess. Meeting Jim was the beginning of a whole lot of fun in my life! There were 396 people at the service, yesterday. Pete said to me on the phone shortly after, "Wow! You don't see that many people at too many people's services!" No, you sure don't! But I think I know why. Jim made me feel good about me. He was so complimentary and without even realizing it at the time, I ate it up. He'd say good things about ifish, about my writing... always flattering me. That's why I was magnetized to Jim, I think. He had gravity. People gravitated towards him in all situations, it seems. I can't help but think he made an awful lot of people feel good. He spoke well of others to me. He was good to be around. Always positive. Always hopeful. That's good to be around! Bill agrees with that, too. He said Jim made him feel good, too. I remember things that made me feel good about Jim. Little things, even. He'd call me up on the phone and say, "Let's go!" That could mean fishing, or simply a drive around the neighborhood! He'd pick me up on a rainy day and drive me over to Longview for breakfast. All the while, he'd say, "I love driving on stormy days like this." And forever after that, I'd think that, too. I'd get in the car on a stormy day and drive, and think, "I love driving in the storms!" And Jim would flash through my mind. He brought out the good in life. The plain, simple good. Good that doesn't cost money. He could turn a rainy day into a delight that lasted in people's memories forever. And that is why there were 396 people at his Memorial service. Never mind all that he had done in his life. Never mind, even how he loved his family, and how they loved him. There were 396 people that felt good being around Jim Erickson. There were 396 people (and several more who couldn't make it!) that were touched by knowing a man who lived by simple means, who loved life with passion and gusto. A man who loved his family and friends so deeply in his heart, and who owned a satisfaction with a simple life that so many people envy. Jim, what was your secret to such full satisfaction with life? From Senators to common folks, we were all famous in Jim's eyes and we will all miss that special feeling he gave us. He most simply made each and every one of us feel loved. I was sitting in the truck with the door open, ready to leave when Christie came running out. "Wait! Wait!" She threw her arms around me to say goodbye. I was stunned! There's some Jim in this young gal and she made me feel loved! Jim really is the gift that keeps giving, in the Erickson family. "Christie!" I said. "Can you believe how many people are here? Your Granddad was famous! He always told us he was famous, and he was! Did you ever believe it?" But, as we continued on home, I thought about the muddy water from the Nehalem river that sat as a decoration on the piano. Jim's coats, that decorated the walls of the church. His favorite rod sitting in the church window. His tackle on the pews. The booklets of favorite stories, printed from ifish.net. I've never seen such a fuss over one man's life! Are we just glorifying a man so highly, because he's gone? As usual, we don't know what we've got, till it's gone. No matter the sadness, almost every memory I own of Jim, leaves me with a smile, or a laugh. And that's why I miss Jim so darn much. The man made me happy. The man made me feel good about me. And there were 396 people, with many more who couldn't make it to the service, who also felt good because of the life lived by Jim Erickson. In my mind, I see a mountain of rocks, all piled up high. This is my hill of happiness that I've built, since childhood. People and pets that I know and love and that bring smiles to me have helped to build that hill. But lately, there have been terrible earthquakes and landslides. Each time a friend dies, the hill shakes and quakes. Big boulders come tumbling down hard on my heart and sits squarely in the middle of the roadway of my life. Kind of like what you might see at the top of Neah-Kah-Nie, going over the hill. All of the cars are stopped, looking out over the ocean of life, waiting for someone to clear that boulder out of the road. Well, I'm waiting. There has fallen another huge, car sized boulder. Our beloved friend and fishing legend, Denny Hannah, has gone on to that wonderful fishing stream in the sky. Today, I pray for his friends and family, who have slammed on their brakes after speeding along in life, only to find a huge boulder has fallen from their hill of happiness. All of those chunks that fall off leave open spaces in our hearts. Holes, actually. Dark, empty crevices. But, the good thing is that these wide open spaces can be filled! We can allow new love, new hope, new happiness to come in and fill up those empty places. I think it's almost necessary. Cuz if we don't fill them up, it makes that hill of happiness really shaky and insecure. Then, the whole darn thing could come down! No hill of happiness? That's a devastating but very possible thought! Especially lately! It seems like I've lost way too many boulders! Quick! Fill it up with new love, and maybe it will make the foundation of the mountain even stronger than it was before! So... let's all come together. In times like this, we need each other. And heck... we've got room now, to fill up those spots with new friendships. I need you. You need me! So, let's do it. Open up your heart and give someone a chance to get in their and fill those empty spaces. Use your friendship with these people that we've lost to learn why you loved them. What did they offer you, that felt good? Were they always kind? Did they love you? Did they remember you, or call you when you were down? Did they send you e mails that made you laugh? Cards in the mail on your Birthday? Offer those same special things that the person you lost gave you, to someone else. I betcha anything, you'll get something back for your effort. Try it. I'm sure going to! Do me a favor. Let me know how it works. I had a setback this week starting a couple days ago. Actually, it was the night of the 8th, after I spent too much time on the computer. I had a good day that day, and thinking I had recovered, really went all out. My mistake! That night, I was in severe pain, and have been, since then. No doctors here in town can figure out why. I'm supposed to go to Portland to have it checked on but the weather isn't cooperating, for a drive over the mountains. My pressure is good and no infection looks present, so the worst things are ruled out. They think it's just marfan, and my weird healing problems. Did I even tell you that the stitches and incisions that they made during the first surgery never healed? So, when they went to fill up the eyeball with fluids, it leaked out like a flat tire. Ish! And weird, weird, weird! Yes... marfan is weird! So, here I am, unable to do anything on the comp. This short column will be all I can take before the pain will start back in and I'll be flat out on my back. I even got up and fixed dinner for the boys for the first time in three days! (Well, leftovers, anyhow!) 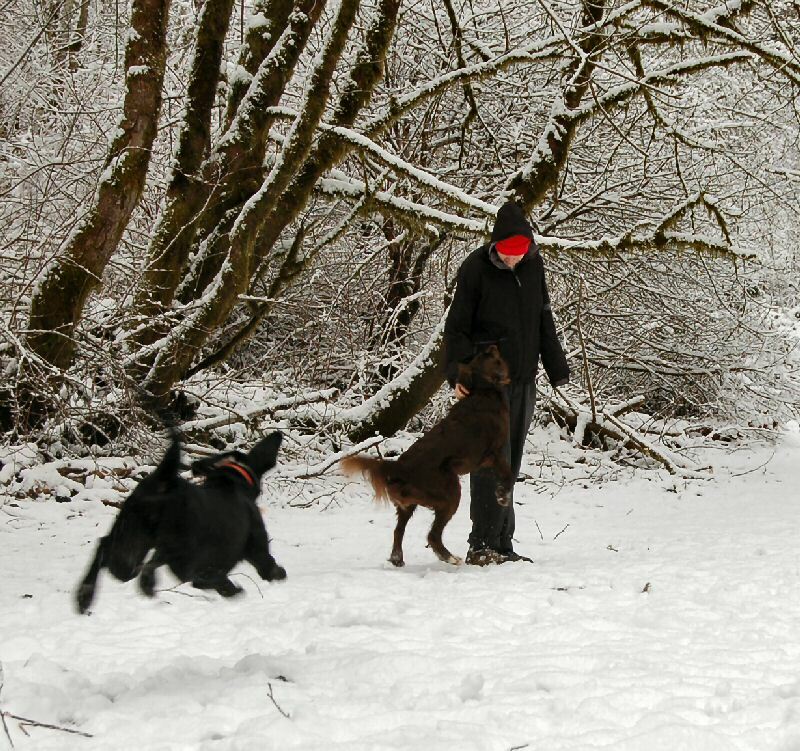 I even took the dogs for a short walk, outside in the snow! Here is a picture of our snow. Isn't it beautiful? It fell off and on, all day as I lay in my bed with new pajamas on. I have the neatest new pajamas, and they fit me! They are extra long. What a luxury that is, and what great fishing pajamas they'll be! They'll even tuck into my socks and into my waders! Well, I promised myself I'd take it easy. I so want to be done with this eye, and get better so that I can get on with the next eye! Have a great day and please... work on building up that Happy Hill! Before I wrote that, mine was crumbling... but really, spiritually and otherwise, we have to think what grand lessons we must be learning from all of the heartbreak that we endure during life. Sometimes while I'm laying in bed, ill, I wonder why on earth I have to take this. And then it hits me that my Heavenly Father is making me stronger, and I can't believe what an awesome God is He, who cares so much for me, that He personally sees me through each struggle. And oh! When I'm well, I realize just how wonderful it is to be well! It's not taken advantage of! That's for sure! Back to bed for this girl. I can't wait to be well again! I have very little time, as it is girls day, today. Time to get my hair fluffed and puffed. 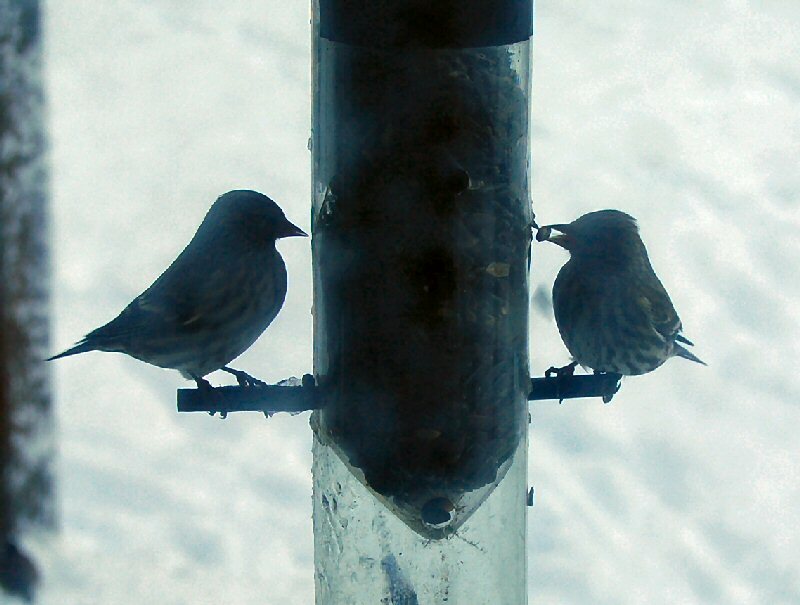 I just wanted to share with you, really fast my very cute little pine siskins that came, from out of the cold. They are so tame! I can get so close to them and they don't spook! However, against the bright snow, they appear very dark. I have to set my camera differently. But, until then, here they are! You can click on them for bigger pics if you like. Here is one more big one. They are so cute! They are famished, too! 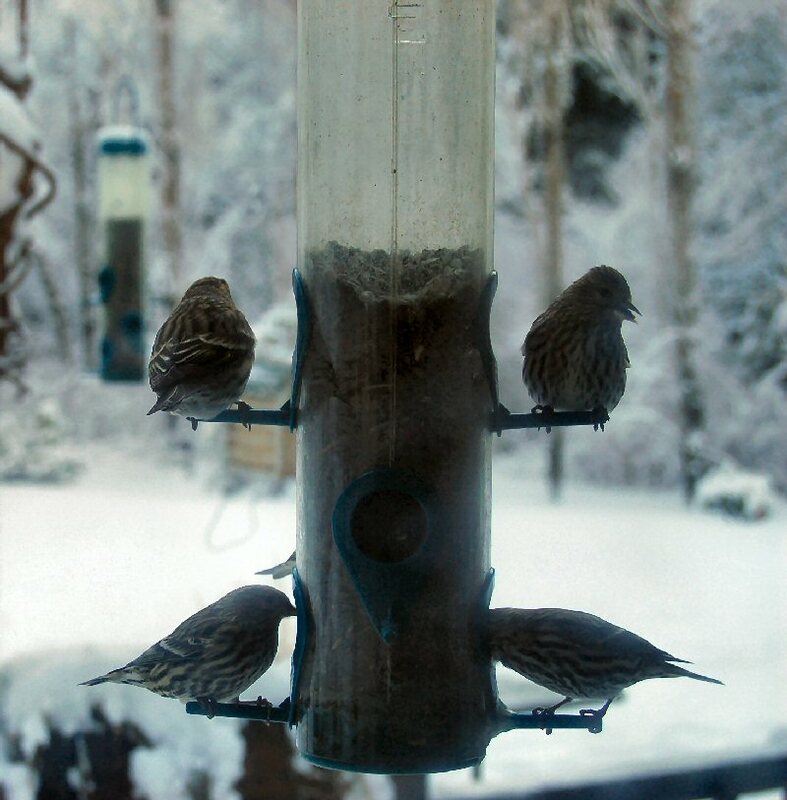 We had a flock of over 100 on our porch! And I'm so excited! My first hummingbird last year was March 3rd. Do you know how close that is? There is hope in this world, and thank God for that! Toot toot! My Grandma once told me that my GrandFather, who had passed on before her, spoke to her one evening as she sat in his chair. That she felt his hand on hers, and he told her he loved her and that it would be alright. I'll never forget her telling me that, and I've been a bit envious that I've never had that kind of experience. I've come to the conclusion, though, that perhaps lost loves speak to us all in different ways, and perhaps in different degrees, as far as how well we knew them, and how much time we spent together. I don't know if that's true, but I have thought about it. I've always been envious of those who say that their loved ones have spoken to them. I've heard of some that are spoken to on the river, or in some quiet place at home, or wherever they are spiritually closest to them. I have had close feelings with them through nature. I just knew they were close to me. The other day I was out fishing and I got hung up on the other side of the river in a tree. It was a tough one. I could see that it had twisted around a branch. Not a chance I had of getting it loose. Still, I tried. I gave it the ole "Erickson tickle" just like he taught me. It held strong. One more time, though, and darned if that jig and bobber didn't come loose and drop to the water. Without thought, I yelled out, "Thank you, Jim!" and turned to Bill. He had witnessed the whole thing, and I bet he felt Jim's presence, too. Recently Bill has spent alot of quiet time getting me rigged and ready for all kinds of fishing. A bit frustrated with my "grab it and run" method of fishing, he took all of my rods and properly rigged them for all different methods of fishing. I think he gets frustrated with me. I get up in the morning, decide what I want to do, and I'll start cutting and chopping and stringing together things that are, well, a little clumsy to say the least. Then, I pull on my waders over my pajamas and go! It's a good thing I didn't have any luck one day last Fall. Bill discovered that one of my rods was rigged up with 6 pound leader and a K-16 Kwikfish! (laugh) Poor blind girl couldn't read the spool package with my ailing eyesight. So, Bill got to work, and strung up a rod with it's matching leader and mainline for each activity. He even strung up a rod to use my planer with. Bill makes fun of my planer. He thinks it's a lazy way to fish. It is! But, I'll tell you! It works for me! Today, Bill talked me into going out for a bit. I've been having trouble with pain in my surgery eye, and haven't been out much. He said, "Think I'll throw a spinner." I said, "Think I'll use my planer!" He laughed, and we headed out. I didn't even think to figure out which rod it was that I was fishing with. All I could tell is that it was a light steelhead rod that I hadn't fished with in ages. It wasn't 15 minutes before my rod took a dive, the planer sprung free, and I yelled, "Bill! Fish on!" All I knew is that I was fishing for steelhead, and either this was a record steelie, or a late Fall Chinook. I played it for a while, and said to Bill, "I think I see red!" Meaning... It's January, I don't see the fish, but I think it's a spawned out Chinook! It was just too heavy for a steelie, and it kept burying it's head, giving me that slow "nook shook" slow, back and forth turn. I finally got it to shore, and released it. Sure be shootin'. It was a Fall Chinook. Hey! Headlines! I can see it, now! 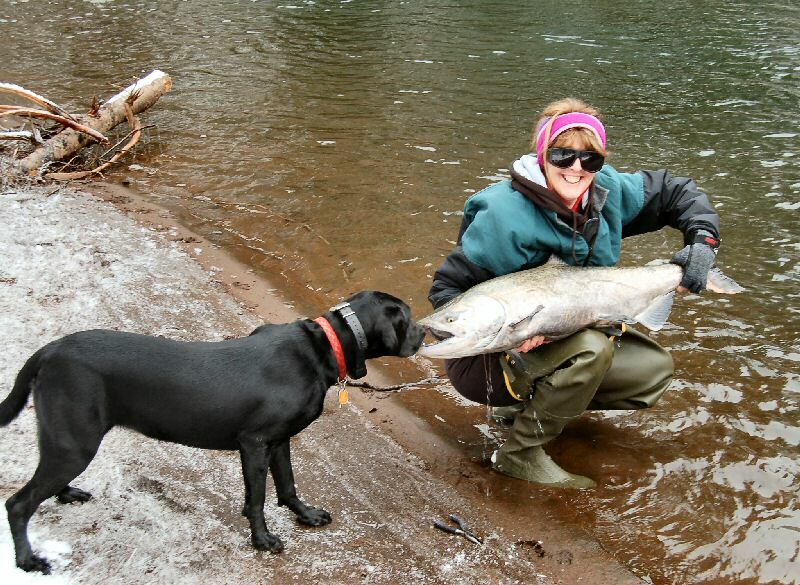 Jennie catches her very first Fall Chinook of the year! --In January! I carefully released it. It was chrome, but not the brightest fish in the river, I'm sure. Probably one that would spawn next week, or so. Still, it was a hoot! I hadn't felt a fish in ages! I am all new again! Gimme my lure back, Mr. Nook! I let it go after snapping a quick picture. I said to Bill. "What do you think of that planer, now?" Deja Vu. I've said this to him before, you know. He shook his head. Then, I had this feeling wash over me. This feeling of Erickson and I didn't know why. I turned to Bill again, and said, "Bill? What rod of mine is this? Is it? Could it be?" It was. 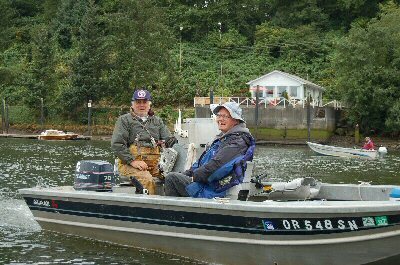 It was the rod that Jim Erickson gave me when he found out that I didn't have a steelhead rod, so many, many years ago! I felt dizzy, and leaned against a log. "Oh, Jim! Thank you!" and I kept muttering... "Oh, Jim! Oh... Jim!" It was Jim's rod, indeed. One I hadn't fished with in ages. I'll fish with it alot, this year, Jim. You can bet on that. This one's for you, Jim! I feel truly close to Jim, out fishing. I will fish the North Fork again. I didn't think I could, but I'm going to. I have to. I'll take Jim's rod with me, too. Oh! And here is a picture of the river snow! Why, when everything is going smoothly, do I all the sudden sit, terror stricken, thinking, "My carotid artery is dissected!" Do you know that? It's dissected! That's not good! Thoughts like these strike me at the most odd times, and I freeze. Oh well. Guess I have to just get over it! It is what it is! The ifish Springer Contest, thanks to Lamiglas and Okuma, has begun! Click here to learn about how you can win a Lamiglas X80MBC. 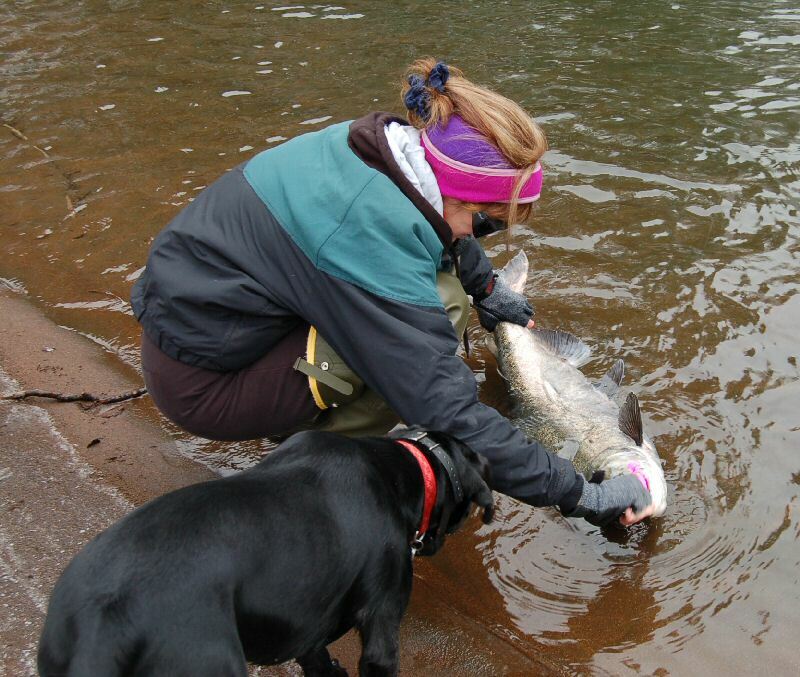 Just be the first one to catch a springer, and post it on ifish! Whoo hoo! Can you believe it's already started? Soon, we'll also have a "guess how many will go over Bonneville" while viewing, "the dam cam!" That will be fun! I love contests! My eye is getting better, round two or three... I'm not sure. It keeps getting better, then worse. It's frustrating because when I had no eyesight, I learned to become very dependent. Although I didn't like that, getting used to being independent again is kind of hard. What do you mean I have to drive to town by myself? :) I was kind of enjoying having company. Does that mean I'm getting old? I'll tell ya... after the last year I have learned that getting older is not for wimps! My skin has gotten much tougher as I've gone through the changes that 2006 and the first of 2007 has brought. It seems to me that the road is still rocky heading in, as I plan to attend Willie's celebration of life. I will be printing a little booklet of ifish stories, written to and about Willie. If you have one to send in, to include in the ifish book of "Willie" please send it, here. Even if you just want to thank him for your boat, or have something nice to say, let's say it now! I've attended so many funerals in the past, and I can't help but wonder how much nicer it would be, to hear the nice things people have to say to us, now, rather than at a service, after we have gone. "Give flowers to the living!" As one of my girlfriends used to say. That's what I plan to do, compliments of the friends at ifish. I hope he enjoys reading it in his spare time! He is sure a wonderful man! I'm so enjoying this thread for him. If you do a search on Willie, you will find so many, many wonderful stories about the man, the boat, the legend... and he is truly a legend, indeed. Oh, sigh... The snow is melting. Everything is sopping wet here at the coast and it all seems a sad wash of a day. So much loss... but I'm keeping my chin up and holding it high. This isn't going to get me down any more than it has to. I'm so, so thankful for my friends. For knowing these people. What an absolute gift to have known the people that I love enough to feel so deeply about their loss! This can't help but mean that they were extremely special people. Yes, we are lucky to have them in our lives! We are blessed forever by memories of them, and to be able to share them with so many people who were also blessed! I sat to think about that very thing, the other day. Just how many people in my life I have been blessed by knowing. It pickles me tink to be able to list so many and how deeply I have loved. Makes for very, very rich living, indeed. I am blessed... and I thank each and every one of them for sharing their life with me. Still... I'd like to ask a favor of my Heavenly Father... Can I take a break from illness? From losing my friends for a bit? I promise that I appreciate them, now, more than ever. I just need a breather! I just can't tell you how much I miss Jim. There is a huge hole in my heart, and I'm trying so hard to mend it. It's just not happening soon enough for me. It's like knowing that there is the Jack, Queen and King up ahead, and you never get to it, to get over it. Maybe I won't get over Jim. Maybe I don't want to! "One more stop" I said to Kilchis, as we pulled into Tillamook Bait Shop. My dog was tired of being in the car. Yet, that happy dog still wagged his tail. I jumped out, and headed for the door of the bait shack, but was intercepted by Marie. "Hey, girl! Bill was just here!" :"Did he pick up shrimp?" In a hurry, I turned around to race back home so that I could hit the river, before dark fell. "Don't I even get a hug?" Duh! Of course! How rude could I be? How hurried? I gave 'my sis' a big hug as we laughed, and then I headed home. I just love that gal, Marie. You never leave the bait shop without a smile. It had been one of those chaotic days. I needed a break. Finally home, I rounded up my wild dogs, and headed to the garage. Kilchis was loudly talking about the adventure to come, (he drives me nuts when he barks and whines like that!) and Rev, was doing those wilder spins. Rev digs out and just goes nuts in circles, when he knows we are going fishing! Have you ever seen the "wilder spin"? I'm ready, I think to myself. I grabbed the freshly divided shrimp from the fridge. Bill always divides them into two containers. In Bill's world, there is nothing that we share. It is always his and hers. (laugh) I just want to know, (I ask him) where in the world is "my" jetsled?!? If I had my way, I'd just grab a couple shrimp and throw them in my pocket. But I play nice, and grab my container. Little did I know, but I was about to have the steelhead trip of a lifetime. It was nearing dusk. I was exhausted from the day. Things had been so easy all week. Usually Fridays top the "easy" off nicely. Fridays are a day of peace where everything goes slowly. Usually, very few e mails, posts, etc. Everyone seems to be readying for the weekend. Not yesterday, though! Yesterday was busy from sunup to sundown! I'd get down to 8 e mails, and before I could push send on the last e mail response, I'd have 50 more! I couldn't catch up! So I was more than relieved to escape the madness and head out to the peaceful song of the Kilchis River. So were the dogs. They both had a rough day, sleeping by my side, waiting. The song of the Kilchis river is extremely quiet, right now. It's got a low, slow flow. I thought about what to fish with as I stared up at the rack of rods. I decided to go easy. My jig rod lay perfectly strung for low water jigging. I brought it to my side, and again made sure "my" container of shrimp was in my pocket. I checked the other pocket for pliers and extra jigs, and I was off. The dogs spun around me as I made my way across the melting snow patches, to the rocky trail and then down to the river beach. 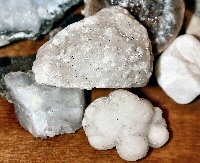 I scanned for agates as I tripped through boulders. With a random, "No, Rev!" Like a playground monitor, I watched that Rev wasn't jumping on Kilchis. Kilchis is wounded with a ruptured cruciate due to Rev's rambunctious play. She means well, I think, but Rev gets to going about 90, racing down the river, and just plows into Kilchis's side. Thus, Kilchis is now a dog who instead of racing for dippers, rather hovers closely by my side, limping along on three legs. It breaks my heart. Kilchis' spirit seems to be a bit broken, also. I'm calling a surgeon this week. The best surgery for this ailment is $4000.00!!! Can you imagine? That much money, and a year's recovery. I blocked that out of my mind, and continued on. I cannot afford that much for my dog. I just can't. I made 5 casts or so in the 'bedroom hole'. Nothing. No easy fish, there. A sluggish spawned out salmon half floated, half finned past me. With a day left to die, my mind wandered to the passing of the seasons. The start of native steelhead fishing on the Kilchis is the first hint of spring, for me. One of my ridiculous birds started singing that song that always makes me laugh. I think it's a dipper, but oh! The song! It's silly and makes me giggle! The days are growing longer and the air feels lighter. The Kilchis has a poor run of hatchery fish. Native steelhead is our excitement, here! A mist of rain fell and gathered on my hair, dripping a collective warm drop on my face. I wiped it dry just below my eye, and surveyed the area I was about to fish. I had made it to the maple tree hole. At this water level, you can see the entire structure of the river bottom, all the way across. I can clearly imagine where the fish hold. It's a beautiful river, with rocks here and there, waving with moss, and one can just imagine that this is the resting place of silvery-chrome darting steelies! My heart began to pick up a merry beat. I heard in my mind Jim Erickson voice, "Don't go too deep. The fish come up to the jig!" Read his article on jig fishing, here. Oh yeah! And remember the "Jim Sez" page? I wish we would have kept that up! Alright-- back to fishing. I slid my bobber stop up so that I was fishing no more than 2 feet deep. Maybe less. I placed a perfectly fresh, perfectly presented shrimp tail on the hook of an older, early made "First Bite" jig. It had a silver ball and two red beads on it. 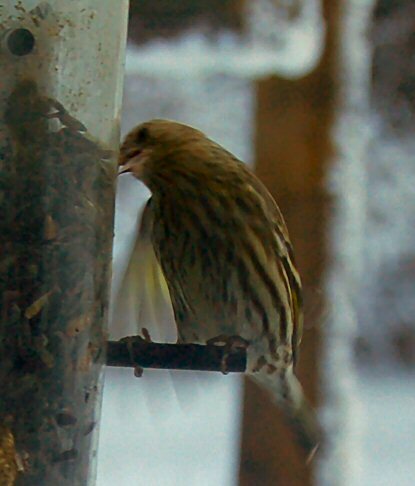 The feathers were pink. Oh! Beautiful! So beautiful that I got goose bumps. I felt fishy! And sure enough... I cast out 10 feet or so before the first fish holding rock. I could see everything. (Thank God for my new eyesight! Whooo hooo!) As it approached that first rock of doom, my bobber began to hesitate. Thinking that the jig had brushed the moss covered rock, I gave it the Erickson twitch so that I wouldn't hang up. Dang! But a beautiful silvery steelie darted away from the rock! My jig hadn't hung up! That was a FISH! DANG! I did, however, properly disengage it from the fish's mouth! Darnit, anyway, but I didn't snag up on that fish! That's for sure! So, thinking surely that I had sore mouthed it, and that it would never bite again, I cast, anyhow. Same cast, same pattern. But-- this time, as it began to 'hang up on that rock' I let it hang up. DOWN went my bobber! DOWN went the tip of my rod. UP went Jennie with the force of trying to extract a four foot boulder from the bottom of the river and UP and clear out of the water came a silvery spinning steelhead! "Whooooo hooo!" I hollered with the "hooo" echoing through the canyon, multiple times! "hooo! hooo! hoooooooo!" A road worker up above on the logging road heard me over his running motor, and beeped some kind of horn in a jolly tone. I smiled up and played that steelie to my hand. Oh, how beautiful it was! Oh how spacious his girth! Oh, how fresh! How chrome! I gently sent him back to the river, and thanked my lucky stars as he swished her tail against my fingers. What a magical experience, and suddenly I thought, "Did that really happen?" It's so odd that after you catch a fish like that, the entire experience seems so unreal, so magical that you wonder, truly, did it happen? The beep that I had heard from the grater above said indeed. It had happened. I wasn't done, yet. I moved 10 feet upriver as my Dad had taught me, and tried for his mate. I set my bobber at the same distance, and refreshed the tip of my hook with the shrimps head, this time. I had heard that a fish will take a shrimp head alot more powerfully than a tail. We'll see! One cast out to the rock ahead of the last one, and the minute it floated over the cutback of the rock, it began to hesitate. The water flowed at a speed just under walking speed. It was so perfect! It hesitated. It began to sink, ever so slowly. Again, my first thought was, "I'm hung up!" But, the lesson I learned previous, kept me from tickling it off. I waited. Sure as shootin'! I saw the darned steelhead who was responsible! That fish flashed and dashed and pulled my bobber down! Out came the scream of a woman with a fish on! The man working the road grater above cut his motor in total disbelief. I could just hear him mutter to himself, "Not again!" I was so proud! Two steelhead in 5 minutes! "You go girl!" I nearly shouted out loud to myself! I brought to hand the most beautiful buck steelie. With no fin clips, but sea lice on his side. It wasn't big, it wasn't monstrous, but it was the most beautiful, fresh, full of life steelhead that I had seen since.... well, five minutes ago! I was totally full of self satisfaction at this point! Totally full up, my ego! I'm sure glad Bill wasn't there! One is one thing, but two in five minutes? That's enough to drive a man's ego away from a girl! And besides, there was not room on this river, for any more ego that I had at that moment in time! It was just me and the man with the road grater. He revved his motor and took off down the rocky logging road. I couldn't see the look on his face to see if he was a little peeved that a girl could pull two natives out of one little river hole, or if he was revving it up in congratulations. I'll never know. But, I'll tell you a secret. I don't do much in life that would get that kind of reaction from a guy, and once and a while, it's rather refreshing. I fished a bunch more, but didn't touch another fish. Instead, I gave up and headed back home to tell my story of 2 natives in 5 minutes. As I opened the door, I yelled, "The natives are coming! The natives are coming!" Bill laughed, knowing full well to sit down. It was time to listen to the breathless story I was about to tell. Bill caught the first native, just days before me. This morning, Bill is all rigged up and ready to outdo me. We'll see. I'm going to go with him! Now, this will be cool! Click here for the new Nehalem Web Cam! I think that will be a blast to watch when I can't be fishing, there! Thank you from our sponsor, Ripple Run, for the opportunity to watch! Thank you for sharing your bandwidth with us! And, when we want, we can get an even closer view by staying at your wonderful rental locations! I'm off to Portland! I have icky goopy eye infection stuff going on, and the doc wants me to come in. It itches terribly. This is awesome torture, if anyone needs any torture ideas! Yesterday I played for an honors concert for David. Want to hear some beautiful music? Listen to Bozza "Aria". It is magical! That kind of music that moves you, way down deep. I love it! Day before I went way up the South Fork of the Trask to do some low water steelheading. What beautiful country that is! Bill hooked into a nice little bright native. I was fishless, but full of wonder. The sun was peeking out through the trees, lighting up the wet moss on the trees like green fire! It was amazing. Cool, crisp, dew on the grass, everything cold! Patches of snow in between the soggy grasses. Clear, crisp coastal streams running fast through the rain forest. Oh! I love it, there! The Trask is so different from the Kilchis! Both beautiful in their own way, but the Trask is somehow more wild, treacherous, spooky! I love the rocks that the water falls over. The water laughs as it shoots over rows of big boulders, never stopping, and falling at a steep, steep angle towards the sea. Amazing to me how different a South Fork can be from the North. On the Nehalem it is that way, the same as the Trask. The South always seems rockier and more barren than the North, which is covered in grasses, and moss covered trees. Very interesting, but both delightful and enchanting to visit! Enough of that. I'll be out of town for three days signing contracts and talking business with folks. I have a mentor coming to visit from Seattle. I can't wait to meet with him! He's a very learned business man, and I hope to glean some of that information from him! Thank God he shares with me! Have a wonderful day! I'll be on the board. Have laptop, will travel! Right after closing the door to my car, I opened the back door in the garage and was mowed over by happy wiggling dogs. Bill was in bed, sick with a temperature of 103 and a stomach bug. The same one I had the whole time in Portland! Yucko! This was not a fun trip and now Bill has it! I'm still suffering from it, but not so bad as Bill is! The dogs were going crazy being cooped up, so after taking care of Bill's immediate needs, we left for the river. It was so refreshing! Ah! Home! We dug holes, threw sticks, and then tired, I headed back to rest. Poor Bill. If it isn't true that men are great big babies when they are ill, I don't know what is. Every 10 seconds a terrible sigh of pain escaped him. "I think I feel worse than after my lung surgery." He moaned. With a temperature of 103, not even budging with Advil, I don't doubt it! Poor thing! I made him a little chicken broth, hoping that would stay down. I set it out on a nice "sick" tray and had fun decorating it for him. You know, for once it's nice to be the care taker as I was born to be, rather than care TAKER in the opposite sense. EVEN if I'm sick, myself! I've always amazed Bill how when I have a fever, I'll still go fishing and still get on with things. Men aren't capable of that. I'm convinced! He lay in bed without moving, for hours! I've got so much to do. We have new Salty Dog decals in. Order them, here. They are so clear and beautiful! Thank you, Greenbuttskunk! He is such a wonderful artist! Both the ifish decals and the Salty Dog decals came out so beautifully! I'm afraid that with Bill's illness, we will not be attending Willie's celebration and that just breaks my heart. However, I cannot drive that far, alone. Plus, I'm not feeling so well, myself. I think with the show coming up, I'd better stay put to take care of Bill and to rest. Well, I better get on some of these 200 e mails I've got to respond to. Man, they pile up! Whatever you do-- don't get this bug! It's really awful! Somehow, this reminds me of Thanksgiving. We all sat down at the table, and Bill began to say Grace. He thanked God for many things, and then he began, "..And thank you Lord (pause) for our good... H... h... h..." he pronounced the "h" but could not continue. The awkward silence was interrupted by giggles around the table, until we were all laughing in full guffaw! "Thank you for our HEALTH, BILL? You mean the lung cancer, the aortic dissections and the blindness, Bill?" That was hilarious. It's a good thing we can all laugh! Have a great day! Despite the poor health, I am going to catch a steelhead, today! Fever or no! This is where my heart is at, this morning. Ah, dang. I missed Willie's party. I was so bummed, but I really didn't want Bill going, as he is still pretty ill, and I can't drive alone. So, the best I can do is hear it from others, and to share it with you! This, from ifish member, "Straydog!" Remember to ask NSIA to get the DVD out as soon as they are able! The weather has been absolutely gorgeous. There is a place, now where the sun actually hits the ground, around here! It's down river, and conveniently right where there is a log to sit on, by the river. I like to sit there and watch the shadow of steelhead going by. It's amazing! These dark shadows, doing an underwater ballet, right in front of me in the cool, deep water. It amazes me how fast the river can change channels. Just three years ago it was shallow, here. Now, it is nearing 8 feet deep, right at the bank! Amazing! On Saturday night, January 27, 2007, over 300 people gathered to celebrate the life of Willie Illingsworth. The event was great, and done in true "legend" fashion! They had a lot of pictures and plaques of Willie's up showing his accomplishments over the years. After a relaxing 'meet and greet' time, as people filed in, complete with live country music, Deb welcomed everyone and had a few words for Willie and such. Then they served dinner. After dinner was complete (a buffet), they had a reception line for people to greet Willy and share their love. Deb tried to keep it moving so that Willie wouldn't be too worn out. He held up VERY well, I thought. Once the reception line was completed, there were about a dozen or more people who had signed up to speak and tell some stories. As Mark Freeman said, it is difficult to tell Willie stories and keep it clean, so there was some pretty raw stuff being shared! There were some great, funny and some very warm stories told about Willie. Buzz MC'd that part of the program and as always did a great job. After the last story was told, they had shots of Tequila for everyone that wanted, to toast Willie with. It was pretty cool. I am guessing there were at least a couple hundred people there. Then, they had a power point type program that included still shots as well as video interviews with different folks from Willies life. That was really cool and is available on DVD, for 20.00, with proceeds going to NSIA. They are also selling little vials in which they will put part of Willies ashes for his friends to take him fishing and hunting. The proceeds from that will go to NSIA as well. After the show Willie spoke briefly and urged everyone to buy a DVD. He said if they make enough money, they might just do this all again!! It was a very fun, touching and love filled evening. I left after Willie left. It may have gotten pretty crazy after that, as they were going to start up the music again. Heck, it was after 9 then, and the thing started at 4:00! Anyway, a great time was had by all and I would urge you to order the DVD of the program. If you know and love Willie as so many of us do, you will cherish this snapshot of the life of a Legend! Seems like once a year in the dead of winter, we are blessed with a teasing week of blue true dreams of sky against the leaping greenly spirits of trees. Oh, how that hits like a bulls eye target of what I see, what I feel, what I touch. Everything is wrong with the sunshine and warmth of this week, and yet at the same time so right and so welcome! Spring is in the air!! Yet the tangle of brown leafless branches surround the soggy pale green field outside my window, and do not appear leaping greenly or spring like at all! As I walk by the water in the coolness of the morning, a warm rush of air blasts me in the face. Where did it come from? It leaves, as soon as it hit, and it's back to cold again. I shiver, wanting for the warmth again. Where did it come from? More teasing from the season wanting so badly to arrive! The level of water is nearly spring like. I can see clear to the bottom and it appears only 3 to 4 feet deep. I see a group of steelhead rush to hide from me. But, it's too late. I know just where they are. I stop to stare, but they are unmoving, and soon meld into the camouflaged rocks. Did I really see them? The "ridiculous bird" that I've come to know so well is right across the river from me. Actually a dipper; she sings every tone of the scale in staccato vibrato! Her song races up and down the scales in every key. Every time I hear it I have to laugh, and so she is known to me as my ridiculous bird. She is a funny little friend that sings to me. When I hear her, I think she must be following me every time I visit, and every time she sings, I think she's trying to outdo her last ridiculous song, mostly just because I enjoy it so much. 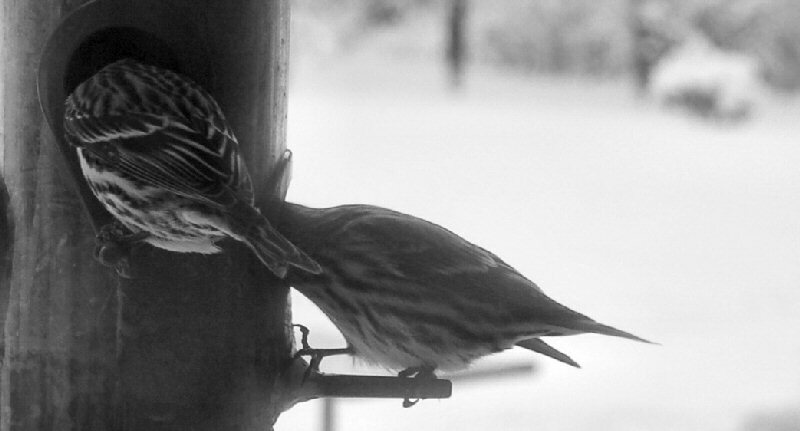 Every thing likes to be appreciated, but this bird, most of all. Perhaps the steelhead weren't hiding, after all. Perhaps they wanted to give me a glimpse just to please me. If so, it worked! The dogs are waggling their tails, and racing here and there. Discovering flat salmon, dead for nearly a month now, and dissolving into the rocks. They are dried and hard to see. Their smell leads me away from them. Their smell, however, leads the dogs right to them! Kilchis has grown out of the stage of wanting to smell like that. Rev, however, can't get enough of that odor. It is a great joy to Rev, to drop a shoulder into them with great force to see how much of that lovely (rotten) scent she can take home with her. Yuck! Bill? Rev needs (another) bath! Spring. It's on it's way. It's not here, but it's teasingly in the background, and on days like this, it has forced a way through the dead block of winter. 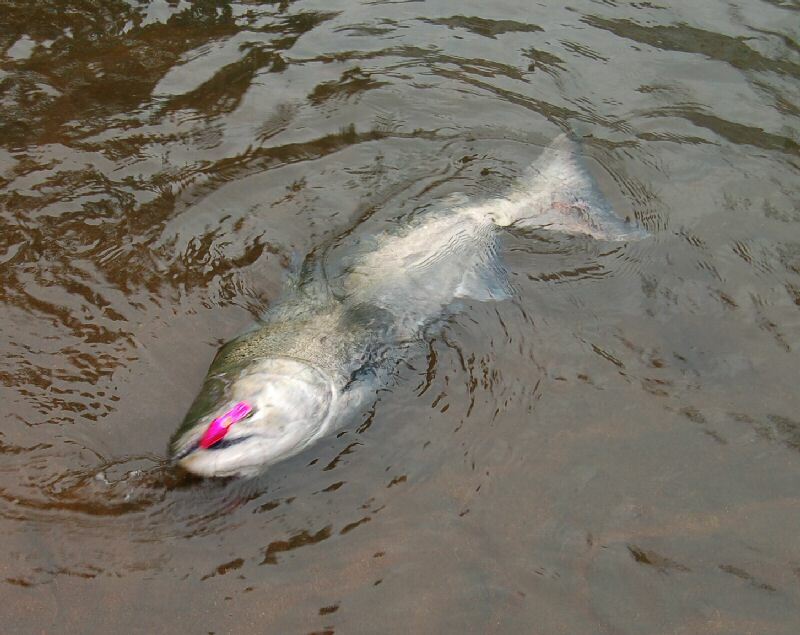 Spring Chinook are on the way. I can feel it in the air. In fact, a few have already been caught. But, the thick of the season, fishing in a tee shirt, the cold of the morning turning to the warmth of noon, and then again shivering as the NW wind picks up in the afternoon... the slap of the tidal changes against the side of the boat... all of those memories are coming close to mind. Really close, as day after day of this week long spring tease sets in. Oh my, how we get spoiled with weeks like this. It seems that just as we get used to it, the rain will return. Yep. I've done this before. This week of wonder and warmth seems to happen every winter. Before the sun returns for good, the icy hail will pelt down on us, and even a surprise snow storm might blanket the earth. But, for right now, today, this week-- I look outside, and for all that I see, Spring is here, and it is beautiful, and I celebrate with a cup of coffee in the first of the bright sunlight that has hit my shaded back deck in months. Memories like trying to get my wheelchair out onto the deck when I was very ill come to mind, and how very, very warming and wonderful it was. I have such strong and wonderful memories of how good the very first warmth after winter can be.